Open doors with Door Hangers! Door hangers provide your customers with an advertising option that is direct, simple, and effective. 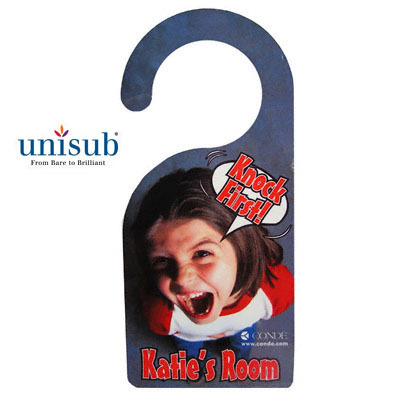 Make a statement before anyone even enters the room with these personalized door hangers. This product will make you money especially in the hotel industry! Also great for a honeymoon suite, a Bridal Suite or Groom's Suite. Great for faceout hanging merchandise display racks where the proprietor wants to highlight aspects of a product including price: "Special Sale! ", availability: "Closeout! ", or features: "New and improved!". The tags also are useful to promote early release product demos: "Coming soon!" or to help up- or cross-sell other products: "Don't forget AA batteries". With a bit of creativity, the tags can economically freshen the look of any shop in just a few moments of swapping a set of tags for another. This could be done to mark a change of seasons, brighten up for the holidays or observe occasions or distinct days of the year. Some will find the tags useful to hang from a car's interior rear view mirror. 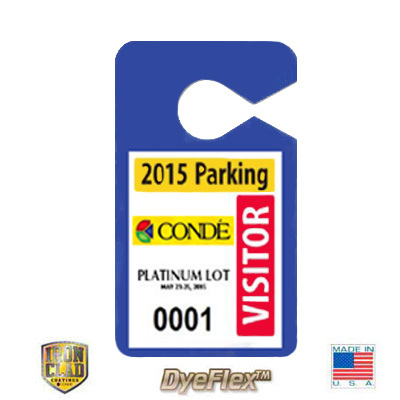 Here they can serve as short term parking passes for special events or to promote an entry at a car show. Both applications make for collectable memorabilia from the respective event. Dimensions: 4" x 9" x .090"
Dimensions: 2.75" x 4.75" x .020"